In addition to the many neighbors that have stopped by to see the chickens and find out what is happening inside the greenhouse, we’ve also had a number of visiting youth groups in the past month. A group of students and parents from the Howe Library came for a tour. 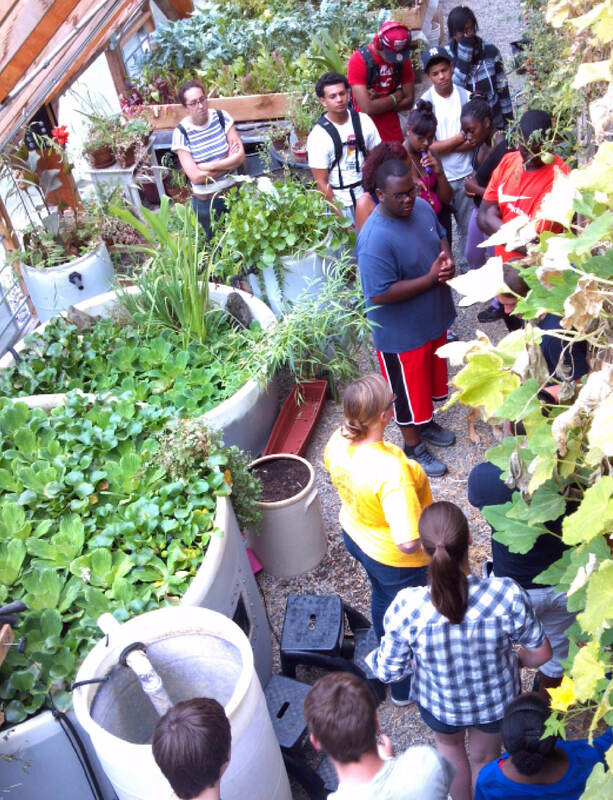 High school students working for Youth Organics, a program of Grand St. Community Arts, spent a morning at Radix. They received a tour and then helped move mulch and sift compost. We also spent a week with a group of high school students who participated in Siena College’s Civic Engagement Summer Camp. After learning about the different systems at the Radix Center, they laid stones for a walkway between our stone garden beds, planted bulbs, got to practice organic insect control (squashing bean beetle larvae – they returned the next day with a box of rubber gloves!) and spent some time with the bunnies.